“Hip Hip Hooray!” These are words often shouted with a merry heart. I am yet to meet a person who does not find joy in celebrating an achievement. Many a time, the achievements we make are not the product of our own effort. When a sales target has been achieved, when customers keep coming back for repeat business, when customers become loyal and bring referral business your way, when you get promoted because of service excellence etc; how often do you stop to acknowledge those that helped you to be where you are? True Servanthood Leaders know that they owe their success to every team member. Acknowledging their efforts helps to build a strong service driven team. One of the greatest enemies to Service Excellence is a divided team. “The wide, deep river, that offers a highway for the traffic and travel of nations, is valued as a world-wide benefit; but what of the little rills that help to form this noble stream? Were it not for them, the river would disappear. Upon them its very existence depends. So men called to lead in some great work are honored as if its success were due to them alone; but that success required the faithful co-operation of humbler workers almost without number—workers of whom the world knows nothing. Tasks uncommended, labor without recognition, is the lot of most of the world’s toilers. And in such a lot many are filled with discontent. They feel that life is wasted. But the little rill that makes its noiseless way through grove and meadow, bearing health and fertility and beauty, is as useful in its way as the broad river. And in contributing to the river’s life, it helps achieve that which alone it could never have accomplished.” Ellen White. Don’t Kill Service Through Selfishness. While true servants should not be seeking recognition in order to serve, it edifies a team when their efforts are acknowledged. Attributing a team effort to self is the pathway to a destructive service culture. Acknowledge and appreciate the contribution of individuals and teams in building a service excellence culture and LET SERVICE LIVE! Can you think of other enemies of service excellence that “murder” service. Let’s share them in the comments section, that we may avoid falling in their pits. Evaluate Your Motives For Serving. Service rendered with wrong motives is service rendered in vain. While the questions below are not exhaustive, they may provide a fair basis for introspection and evaluation of one’s motives for serving. Do you stop serving because you are not being applauded or appreciated? Would you continue serving even if no one was watching or praising you? 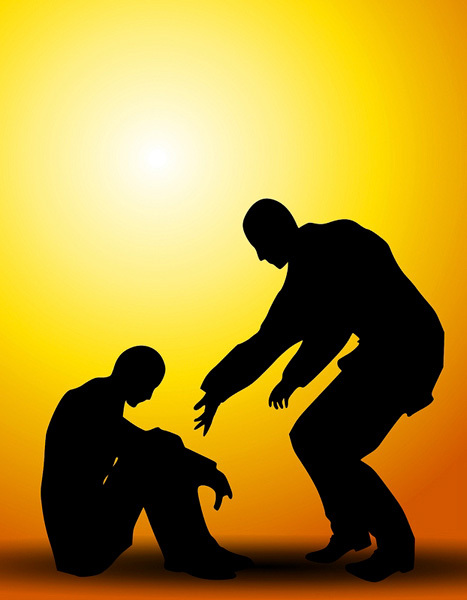 Would you serve even if there were no hearers of your good deeds? Is serving an opportunity for you to show off your gifts, skills, talent, resources? Are you serving yourself (to enhance your own brand) or serving others? Who is in your mind as you serve, the people you are serving or the eyes and ears in your vicinity? Do you serve so that God can see you and reward you with blessings? What are the Right/Wrong Reasons for Serving? Our primary reason to serve is; it honours God when we serve others. Our motive for serving should not be because we want something from God. God can not be bribed by our good deeds. Even though by His grace, He promises rewards; these really should not be the focus and purpose of our service. Neither should our service be aimed at feeding our egocentric ambitions. 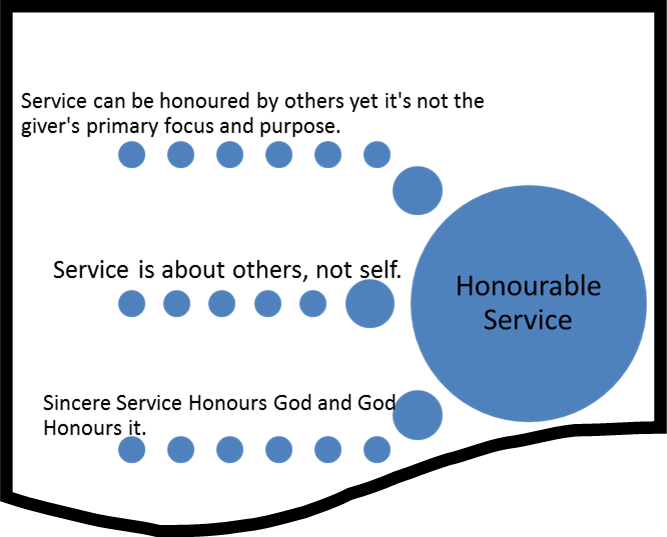 How can you make your Service Honourable? Honourable service is one which is treasured by others yet it was not given for the purpose of receiving that honour. It is a sobering thought to remember that when we serve; it is not about self but about others. May our service be honourable as we serve for the right reasons. In so doing, we honour God and God honours our service. If you were blessed by this article, be generous to share it with others. Africa celebrates African Day on 25 May, an emblem of African Unity. It seems anomalous to celebrate when most media reports about Africa are on poverty, HIV, corruption, war, conflict or Zimbabwe’s record breaking 100 million % inflation rate. While these exist in Africa as they do in so many other parts of the world, one who has had a close contact with Africa; closer than TV News or Newspapers; one who has shaken an African’s hand, has dined with them, laughed and smiled with them will certainly have a different story to tell. One singer expressed joyfully; Count your blessings name them one by one, and it will surprise you what the Lord has done. God blessed Africa. Africa is rich in natural resources, jungles, wildlife, and ivory. Africa is believed by Historians and Archeologists to be the origin of all mankind(Adam and Eve). Some even believe that the biblical Garden of Eden was situated in the Northern parts of Africa. Egypt in Africa was the mother of ancient civilization. Africa has a good climate; it is the only continent crossed by the Equator, Tropic of Capricorn, Tropic of Cancer and the Greenwhich Prime Meridian. Africa is blessed with diverse cultures from the Masai in Kenya, San of Southern Africa, Swahili of eastern Africa, Arab culture of Northern Africa and the Westernised cultures in most big cities. Africa is home to the Highest free standing mountain in the world (Mt Kilimanjaro), Longest river in the world(Nile), 2nd Largest fresh water lake in the world(Lake Victoria) and the Deepest fresh water lake in the world(Lake Tanganyika). Need we talk about the majestic Victoria Falls in Zimbabwe; a major tourist destination. I could go on and on, but really this is enough to prove a point, Africa is rich! The African people’s pockets may not be equally rich but their hearts are abundantly rich. Most visitors to the African continent treasure the African smile, warmth and hospitality as the greatest souvenir to take from Africa. Africa has a culture of treating guests well. In Zimbabwe’s Shona language they say “muenzi haapedzi dura” which means that a visitor will not exhaust your food reserves. This is a call to be hospitable to guests and not allow one’s hospitality spirit to be limited by one’s poverty. So when the world looks at Africa and see poverty, we see in us a heart to share the little we have. When the world sees a conflicting Somalia, we see its unity as it is the only nation in the world that has the whole country speaking the same Somali language. When the world sees leaders who have led wars that claimed millions of lives in Congo, we see leaders like the late Nelson Mandela who became the most positive influence in the world. As we celebrate Africa Day, we remember to live the true pillars from which African homes are built. An African home has respect as its foundation; respect for one another in the spirit of Ubuntu. Children belong to a community and every elder is responsible for every child in the village. We are our brother’s keeper. Women respect their husbands and serve them in the home not out of oppression but out of love. Would you think of a more wonderful tourist destination than Africa? Africa Serves! Why not experience the African hospitality for yourself and live to tell the story. Do you have a comment or story to tell? Share it in the comments section. When poll results leak, it is prudent to be curious concerning who leaked the results? Any person who has taken to the polls to vote for the leader of their choice, would naturally be interested in the results regardless of whether they have leaked or they are official. Your customers vote for your brands and they are interested in their poll results whether leaked or official. They are interested in what the market is saying in the city streets about your company as well as the official financial statements you publish. I must admit, I do not follow much of politics but there are a couple of lessons on customer service that I learnt from politics which I would like to share here. Politicians just as organizations are expected to be servants; to serve the people who support their party or organization. The customers are the lifeblood of an organization, just as the electorate is the lifeblood and customers to a political party. While citizens vote for political leaders, customers also vote for service providers. They vote with their money and their feet. Unlike political polls which have a set date, customers vote on a daily basis; they have power to vote for your competition any time, any day, without waiting for a set date. Politicians have a grace period unlike organizations. They can go silent soon after being elected into office and resurface a few months before elections, campaign and still go ahead to win the elections. Organisations on the other hand have to be campaigning everyday not just in advertising talk but in walking the talk, in creating positive customer experiences, for mere talk is cheap. Every organization as any political party, understands the value of having loyal customers. Customers should feel that your organization is worth voting for, because value is what customers pay for, as the term goes “value for money”. Customers should vote for you because they want to, not because they have no choice. Most organization survive because they are a monopoly or they got into the market first. However this should not make them complacent because the business world has moved from globalization to “globality”(borrowed from Dr Shingie Munyeza) where organizations are now competing with the rest of the world against the same standards. Challenges that we fail to solve in our country can invite solutions from other parts of the world as is the case of generators to alleviate electricity challenges. Whatever happened to the word ‘integrity’? In customer service as it is also in politics, it is important to deliver on your promises. Do what you say you will do. Say what you mean and mean what you say. Don’t over promise and under deliver. Be a person of your word as God is. God says “I watch over my word to perform it” (Jeremiah 1v12, Ezekiel 12v25). This means that God takes his word seriously and is a servant to his word. He has exalted his word above himself (Psalm 138v2). In other words; if he said it, he is obligated to fulfill it. “His word does not return to him void without accomplishing the purpose for which he sent it” (Isaiah 55v11). This in a nutshell is called INTEGRITY. Integrity is doing the right things even if no one is watching. Organisations carry out their campaigns as politicians do, through advertising. Much of it is cosmetic and is only done for the sake that they want to benefit from the customers, not that they really have customers’ interests at heart. On the other hand however, customers care about customer care and customers don’t care how much you know until they know how much you care. To a business as in politics, a customer is always right and has the power to make or break your profits through their vote. Why not genuinely start to listen to your customers today! It is funny how people point fingers at politicians for their supposedly lack of integrity yet we do not see the shortfalls we have in our own organizations, families and communities. Without justifying the actions of some unscrupulous politicians, people who see the speck in the eyes of politicians, do not see the logs that are in their own eyes when they do misleading adverts, are unfaithful to their spouses or even neglect their parents in the rural areas. Before you judge others if they are worth voting for, ask yourself “am I worth voting for?” Will my family vote for me that I am the best mother/dad they could ever ask for, will my employer vote for me that I am the most productive employee they have ever had, the list goes on…..
We all have a part to play in making our country a tourist destination of choice, the bread basket of Africa by exhibiting true servanthood. If we stop saying “something must be done” but rather say “I must do something”, we can achieve more meaningful results. 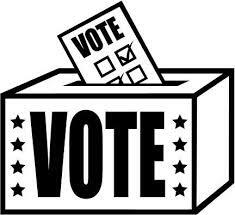 Do something today to make your family, organization, community and customers cast their vote in your favour, then go ahead and cast yours in favour of another who deserves. Then of course wait for the results, whether leaked or official…. Disclaimer. The views expressed in this article are not politically motivated and do not intend to discredit any person, political party or organization. 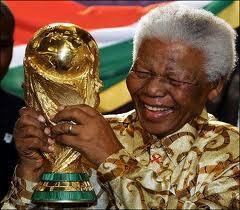 The curtain came down on AFCON 2013 as the Super Eagles of Nigeria scooped the prestigious cup. I can make this statement safely- People love football. A 90 000 seater stadium was full to capacity. I visited my young brother Nick on one weekend and arrived while he was watching the AFCON quarter final match between Nigeria and Ivory Coast. He greeted me with a wide smile and eyes glued to the TV screen. I got proper and enthusiastic attention only after the match, and I owe it to Nigeria’s win. The story could have been different had they lost. Needless to say, the excitement would spill over into the office the following day, as he would have proved to most of his colleagues that he supports a winning team despite the fact that Ivory Coast was a starred team and most workmates would put their money on it. So having witnessed this contagious enthusiasm, I decided to watch the final match, not essentially to support a team but to support the supporters- my brother in particular. As I sat there watching the match, because my mind thinks more service than football, I could not help but learn a few customer service lessons from football. I just picked 5 here for discussion. 1. Giving the best to your customers pays. People would not pay money to come and watch stuff that wastes their time. Supporters derive value from watching football. If you deliver value for money products or services, people are willing to pay for them. Players would probably not play as hard as they would if the stadium was empty. Doing things well, creates followers for your brand. If you work on creating value that people are willing to pay for, the number of people around you who expect that value consistently will start working on you. Their support energises you to do more, better. If you give good service to your customers, it grows the personality of your brand and it also fattens your bank account. Football gives birth to more than just supporters. It gives birth to loyalists, brand advocates and Raving Fans. Even if their team is not the one in the lead, they keep supporting, singing, chanting slogans with the hope that it’s not over until it’s over. Loyal customers grow a business. They give their allegiance to one brand. They spend their money on you and not on your competition. They are brand advocates who will never testify against your brand but stand to defend it from anyone who suggests doing so. They take over your brand and make it theirs. They brand their face, clothes, musical instruments etc with your colours and logos just to show to whom they are affiliated. Would your customers do the same with your brand? Do they love you to this extent that they want to tell the whole world that they are proud to be associated with you? You may also want to check this article which I wrote on creating Raving Fans. 3. The Platinum Rule of Customer Service. The Platinum Rule of customer service says “Do unto the customer as the customer wants done unto them”. In a bid to please your customers, maintain integrity and your customers will respect you for fair play. Climb to the top without pulling others down. Accumulating yellow cards and red cards against your opponents and competition makes you accumulate yellow cards and red cards from your customers too. Do unto others as you would want others to do unto you. 4. Customers want service not excuses. When fans come to support you, they are expecting a win- full stop. Except for a few people like my brother, most people don’t handle defeat well. It usually comes packaged in tears, taking out the anger and frustration on children, spouse, co-workers etc. Fans are not concerned with the fact that the pitch ground was uneven or the ball was not as round as it should be. When customers come to you, they don’t want excuses of why a quality product or service cannot be delivered. They want results, so deliver to their satisfaction. 5. Team -Work scores the goals. Though on that Sunday, Sunday Mba took the ball home for Super Eagles, it was not his effort alone that brought the AFCON Cup to their camp. Some were leading from within-Captain, and others from outside-Coach. Fellow team members; strikers, midfielders and defenders all played a role in sending defeat packing. In an organization, everyone should work to the benefit of the organization. Be concerned about the goal not the fame. A lot of progress would be achieved if people did not concentrate on who gets the credit. After all, none of us can be everything though each one of us is something. Play your part and Together Everyone Achieves More! Just as the Super Eagles have soared to great heights, I pray that you may also soar to great heights in 2013 in your endeavours and customer service efforts. If fans can love a team that much and would dare to make it known even if the players themselves don’t even know the fans by name, how much more love shall you extend to people who know you by name and more still to One who knew you before you were made in your mother’s womb-God! (Jeremiah 1v5). Now Your Turn. Share the Customer Service lessons that you have learnt from soccer. Talentism-Have You Caught The Wave? I had the priviledge of being the Mistress of Ceremony (MC) at the Government, Local Authorities and Business Customer Service Conference which was hosted by the Contact Centre Association of Zimbabwe. Among the presenters from South Africa, Portugal and Zimbabwe; was the guest of honour for the function; Deputy Prime Minister of Zimbabwe, Professor Arthur Mutambara. It was in the content of his speech that I picked a term which I have used to entitle this article; Talentism. Among the things he shared was a concept that he called Talentism. Now don’t try and look that up, you will most likely not find it in the dictionary. He defined Talentism as the use of one’s talent to prosper. His challenge for the day was to convince the delegates that talent, not capital, was the greatest asset that a person can possess, contrary to our traditional belief. The emphasis was on the fact that the days of Capitalism are over and now we are in the era of Talentism. Over time the meaning of capital has transformed to mean dollars and cents yet in fact the word Capital is derived from the Greek word Capitos which means “intelligence”. One’s amount of capital was therefore not measured by the amount of dollars one had but the potential he/she had to make money based on the capacity of his/her intellectual muscle. Well, the point was driven home. The good book in Proverbs 18v16 says “A man’s gift will make a way for him, and brings him before great man”. This shows that talents open doors of opportunity for people. It is necessary to acknowledge the fact that talents are gifts that we receive from God hence one’s talent comes with responsibility. God expects us to give an account of the talents he gave us since we are stewards. Stewardship of these talents goes beyond just doing something with the talents but rather doing everything that the talent was supposed to achieve. In Matthew 25v14-30, the Bible gives an account of the parable of the talents. The man who was given 5 talents came back with 5 more, not 3 more. The other who was given 2 talents came back with 2 more not 1. The last one who was given 1 talent came back with no extra talents. The last one was cursed for being unproductive with the talents that he was given. On the other hand, the two who were productive, did not just do something with the talents but they did the best they could to bring back a 100% increase. God wants us to use the talents he gave us to make the world a better place and bring glory to His name. Luke 12v48 says “To whom much is given, much is also required”. The more talents you have, the more responsibility you have to use them to serve God and mankind. Have you exhausted the potential that lies in your talents? God has given people talents but a number of people suppress the talents simply because they want to conform to the world’s standard of success. 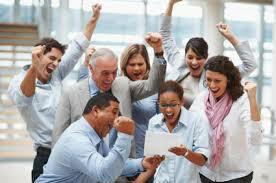 To most people success means having a good job which gives them a nice office and they drive a nice car, etc. They therefore forsake their talents for fear of venturing into the unknown. A great number of times, people just work for the money but their hearts are far from their assignments. Unfortunately if you are not doing what you are called to do, the probability that you find the assignment not enjoyable or at times awfully difficult is high. It is better to earn little or no money doing what God would have you do than to earn a million dollars outside of God’s will. Start running in your own track. Do not conform to this world. You will be accountable to God for how you used the talents he gave you. Is your talent to sing, play sport, speak, lead, serve, etc? Then do it with all you have and when this life is ended, you may stand before the righteous master as He says “Well done, good and faithful servant, enter into the joy of your Lord.”(Matt 25v21,23). If you would like to join others who would like to commit their talents and gifts to serve God and mankind, join the Called To Serve Ambassadors. Organisations are created to serve people and meet their needs for a profit or non profit. An organization that stops serving, commits suicide for no organization survives if it stops meeting the needs of its customers. Many times, when organizations are at the helm of success, they become complacent and forget the WGYTFP factor (What Got You There in the First Place). More and more organizations are becoming sensitive to the Happiness Index in their organizations. This index is a measure of how happy employees are at work. The Happiness Index is significant because it has a positive correlation with employee productivity and organizational success. One of the major elements that creates happiness in employees is being able to be of service to their customers. Employees are happy if they have to provide more solutions rather than excuses, if they receive more compliments than complaints or if they have to tell customers about how they solved their problem rather than reasons why their problem can not be solved. It motivates employees to serve customers if the organization has systems and processes that support and enhance service delivery rather than systems that ‘sabotage’ service delivery, or has policies that are customer centric rather than policies that only spell out what the organization can not do for the customer. The list could go on and on…. Here is the point; people want to be bearers of good news to their customers not bearers of bad news. Employees need to be capacitated through systems, processes, tools of trade etc which are a foundation to the frills of the smiles, thank yous and general customer service courtesy. Being a bearer of bad news to your customers can be likened to the customer rejection process in the sales cycle. Facing rejections puts a dent on one’s self esteem. 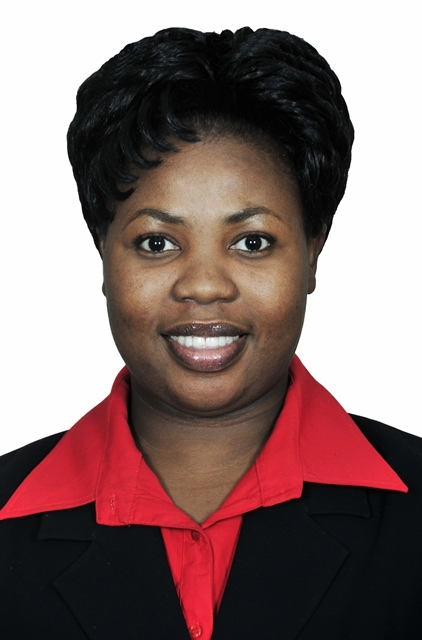 The same is true in service delivery; as employees continuously face rejections from their customers in the form of complaints, their self esteem and assertiveness is affected. This is not to say employees should use this as an excuse to offer poor service. One should always look on the bright side and do the best they can under the prevailing circumstances. So how does giving good service contribute in making an employee happy and raise the Happiness Index? 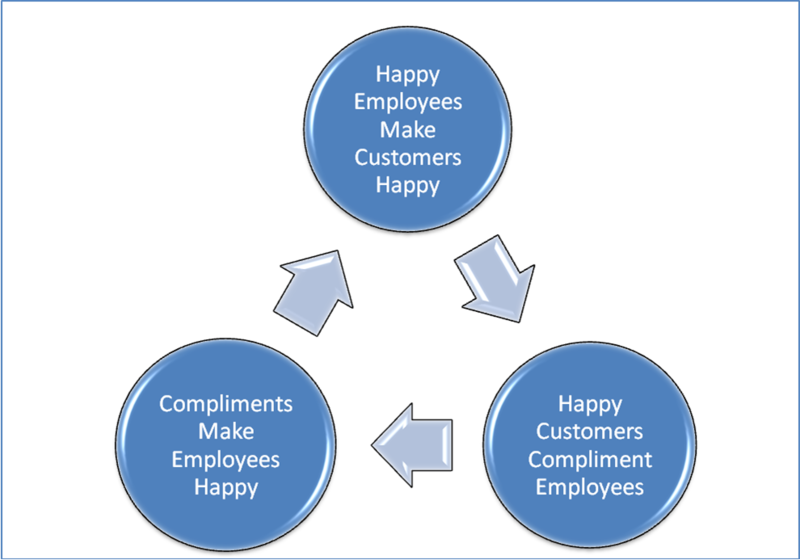 I have come up with the cycle below which I have called The Customer Service Self Fulfilling Cycle to illustrate how providing good service can make both the employee and the customer happy. Sign up your email address to follow this blog via email and receive new posts automatically. Best of all, share with others. Music, poetry, theatre, pottery, beadwork, sculpture, painting, you name it , characterises the ever colourful Harare International Festival of the Arts (HIFA) extravaganza. I decided to treat my eyes to this spectacular event and experience what the Zimbabwean and International artists have to offer and surely, was i not surprised! It was a case of Experience surpassing Expectation. There were different forms of art; some made their art from stone, others from wood, beads, wires, bottle tops, cloth, pegs, matchboxes, the list goes on. It was fascinating to see the different themes that can come out of people’s minds as they explore and express their artistic talents. I then remembered a certain singer, singing; “If I had to paint a picture, to show the world how true love could ever be, I would use the brightest colours…it’s the colours of a rainbow…” and another singing “Paint my love, it’s the picture of a thousand sunsets, it’s the freedom of a thousand doves…”. I realized that since love is intangible, you can not literally open your heart and just let the loved person see the love gauge inside, hence you try and express it in ways that they can see and touch. 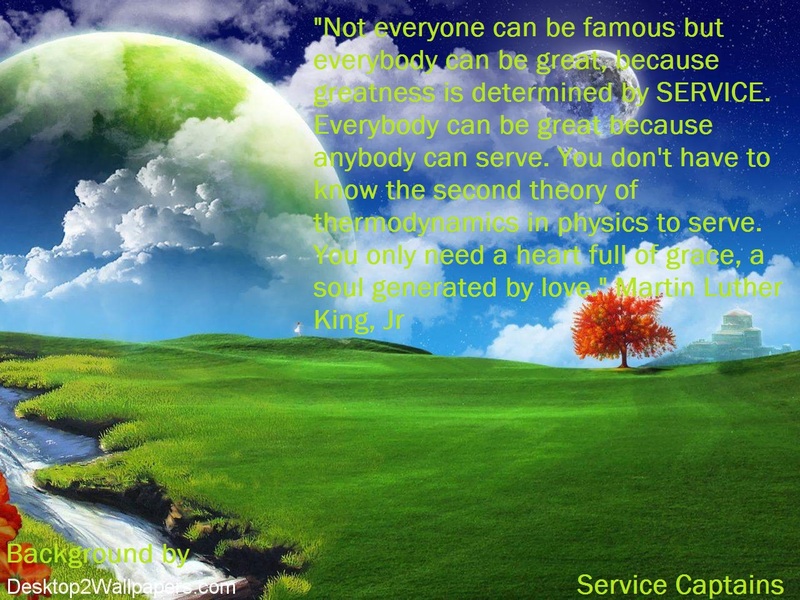 Another characteristic of service is that it is Heterogeneous. No two people can produce the same exact service in exactly the same way. Why? Because we are all unique and everyone will attach their own personal brand to the service they give. This does not mean though that the service should be different in the sense that one is poor and the other is good. They can both be good but good in different ways. It is the same with the piece of artwork. One is embroidery, the other is pottery, the other is beadwork. They are all different yet all good. Don’t try to be what you are not. Don’t fit into someone else’s mould. Be yourself and shine! One thing I know is that I would like my service to be the best piece of artwork ever exhibited. I would want it to be something that someone would be proud to take home and display for everyone who enters to see. Would your own service be like that? Would people take it to their home and exhibit it by word of mouth to their family and friends. What are your customers saying about your service? What piece of artwork is your service? Customer satisfaction is an integral part of service delivery. The ultimate goal of providing a service is to satisfy the recipient of the service. One man put it this way “The best way to look at service is through the customer’s eyes”. With service, it is not about the amount of effort you put but it is about the output. Customers pay less attention to the labour pains, but are interested in whether eventually the labour pains produce a baby or not. It does not matter how hard you have tried, if the customer says it is poor service, then it is poor service despite your drained energy. Service providers always try to meet or surpass the expectations of a customer. But what does this really mean? Customer Expectation– Customers have expectations from a business. Expectations are generated from their perceptions of what the business can potentially deliver and what the business itself promises to deliver. Customer Experience -When customers visit a business to consume its service, they receive a particular service. The What and How aspect of the service they receive is referred to as the customer experience. Now the variance between the expectation and the experience is what constitutes customer satisfaction or dissatisfaction. Picture it this way; Sitting in the lounge watching your favourite TV show, you catch a KFC kind of smell coming from the kitchen. This creates an expectation in your mind of what kind of a meal you are going to have; certainly a good one. When dinner is served, and you take your first bite, that becomes the moment of truth. That constitutes the experience. Whether you will say wow! or yak! or okay! depends on whether your expectation of what the meal would taste like was met or not. 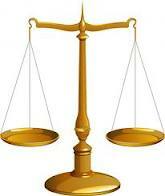 To which side will the scale tilt? 1. If the customer’s expectation was lower than the experience, it means that the service provider surpassed the customer’s expectation and the customer is beyond satisfied. They are likely to be saying WOW! For you to give your customers a wow experience, it’s important to know their expectations so that you can aim to exceed them. You can use a number of tools to harness the expectations of your customers (subject matter for another day). 2. If the customer expectation was higher than the experience, it means that the service provider did not produce a satisfaction index which was higher than the customer’s expectation index hence the customer is dissatisfied. 3. If the customer’s expectation was at par with the experience, it means that the service provider met the customer’s expectation but there is nothing to ride home about. Service provider is unlikely to receive either a complaint or a compliment from the customer. Aim to move your customers from being Dissatisfied, to being Satisfied , then to becoming Raving Fans! Raving fans are loyalists. Loyal customers (subject matter for another day ) are a huge investment to any business. Customers become loyal if they consistently receive excellent service. The idea is to satisfy the customers over and over again until they see no reason to patronize your competitors. When you give just enough service, it is invisible to the customer. We need to travel in the decongested road with no traffic jam; the extra mile. Very few people bother to go the extra mile, yet this is the mile where you find Loyalist, Advocates and Raving Fans for your business. Make someone’s day; do unto them as you would like done unto you. Give the kind of service you would want to receive. Be generous with your smile, remember you don’t lose it by giving it away. If you have been blessed by this article and would like to receive more of such kind of newsletters, send a blank email to calledtoserve.embassy@gmail.com with the word JOIN in the subject line or simply enter your email on the ‘follow’ section of this website. Do you want to be an advocate for service excellence? Find out more , click here.